Enjoy an adventure of discovery like you've never experienced before at the TELUS World of Science. The TELUS complex features 5 interactive permanent exhibits designed to educate visitors with dynamic displays and fascinating facts. The highlight of TELUS is the Science on a Sphere gallery. Explore the mystery of the galaxy in Space Place, explore the human body in The Body Fantastic, solve a puzzle in Mystery Avenue or enjoy the starts through the Observatory telescopes. Currently undergoing a $3-million renovation, Canada’s first IMAX theatre will feature a five-story screen, digital surround sound panels, 3-D screenings and 275 premium luxury seats. The theatre is scheduled to reopen late December 2013. 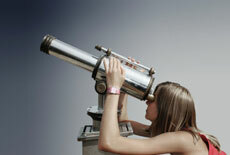 See the stars, sun, moon and planets through the high powered telescopes at the TELUS Observatory. Explore the sky with one of the seven telescopes provided by the Royal Astronomical Society of Canada, including 3 solar scopes, a 7” Starfire, and a 16” Meade LX200. The Syncrude Science Stage features science demonstrations involving dry ice, flammable gases, or electricity. The most popular events include Beyond Kitchen Chemistry, Cryogenics, and Fire & Fury. What is one of the centre’s most notable facilities? Margaret Zeidler Star Theatre is a 250 seat dome theatre used for star and laser shows. The theatre features state-of-the-art technology and dome shaped facility that has been wowing audiences since 2008. Admission to the Star Theatre is included in the entry fee to TELUS World of Science. What services are available to guests at the centre? All of the facilities at TELUS World of Science are fully accessible and offer the use of wheelchairs free of charge. Lockers are available in the main lobby for a fee of $1.00. Food and beverages are available at the Concession area and Café, both offer a variety of sandwiches, salads, burgers, snacks, soups and drinks.